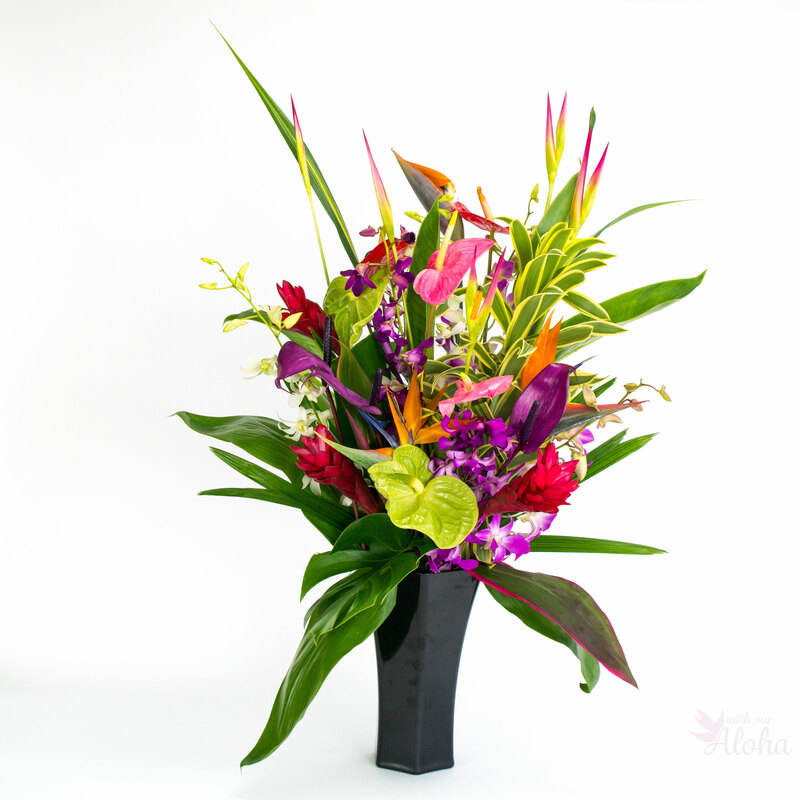 Categories: Hawaiian Tropical Flower Assortments, Most Popular. Hawaiian flowers in a supreme assortment. 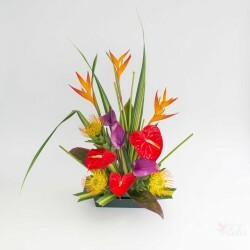 This is our most popular and amazing tropical collection. 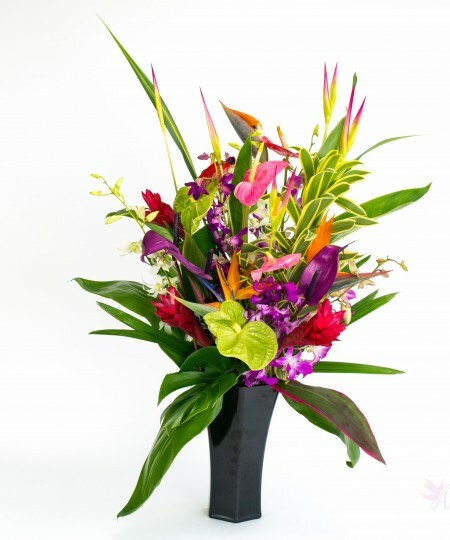 We send 26 tropical stems including ginger, anthuriums in red, pink and green, heliconia, bird of paradise and, of course, orchids. 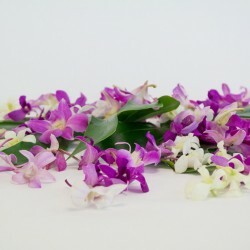 To that we add an assortment of greenery for a remarkable selection of tropical flowers. 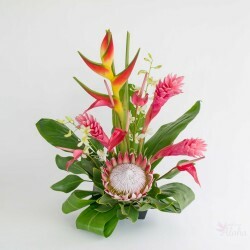 If you are looking for a truly impressive Hawaiian flower gift this is the one. 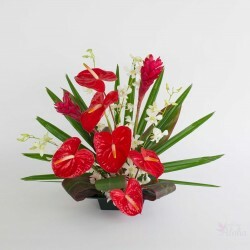 For someone who loves tropical flowers this has a lot of variety that will please them. We’ve balanced this assortment in every way. There is a mix of colors. There are also tall, heavy flowers like the red ginger. We balance this with lacy orchid sprays. 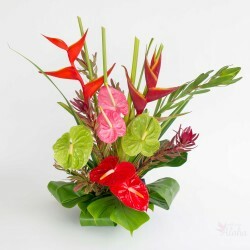 Four types of anthurium are included in red, pink, green and the smaller deep purple tulip type. The twenty six stem count does not include foliage. 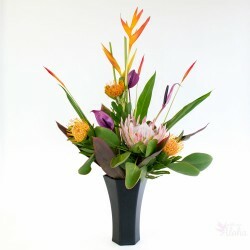 We’ve added a variety of leaves again to balance your arrangement. Ti leaves are long and somewhat wide. Raphis palm is a fan shaped leaf good for backing the display. Monstera is the widest of the leaves. Song of India is a bushy stem with lovely variegated green and yellow leaves. Use the leaves to fill out spaces as you arrange. 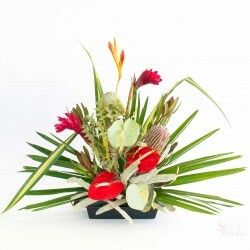 This assortment can be used to create one great arrangement or several smaller assortments. 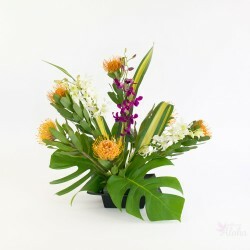 As one arrangement it can be up to three feet across. There is no ‘right’ or ‘wrong’ way to use them. Be as simple or creative as you like. 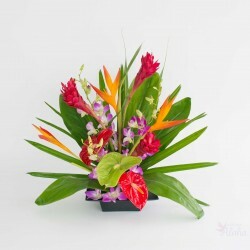 The Tropical Supreme makes an impressive gift or display for your home. Want to know more about tropical flowers? 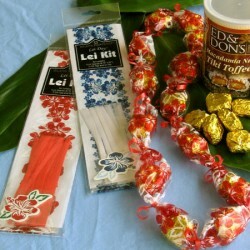 Visit our Hawaiian Flower Guide. 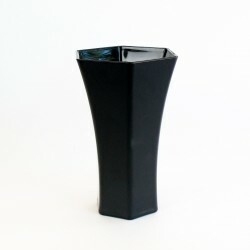 Our vase will hold about 12 stems so this assortment will not all fit. These Hawaiian flowers come full length and not arranged.